For the pre-wedding rituals – the Mehendi and the Sangeet – on Friday, November 30th, Nick wore his L.U.C Lunar Big Datetimepiece featuring a self-winding mechanical movement, silver dial, with a case in 18k ethical rose gold by Chopard. 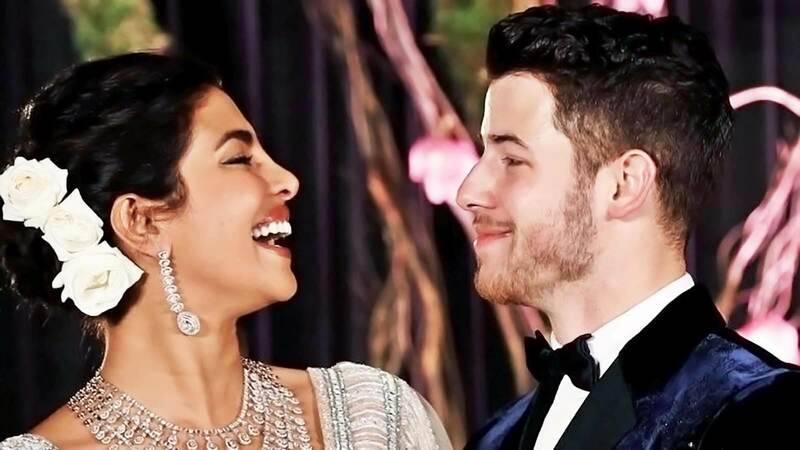 For their Western Wedding ceremony on Saturday, December 1st, Priyanka and Nick exchanged a pair of Chopard bands. Priyanka’s band was from the Haute Joaillerie Collection featuring 3.90-carats of Ashoka-cut diamonds with an east/west setting in platinum by Chopard. Nick’s was an 18k ethically sourced yellow gold band. For this ceremony, Priyanka sparkled in earrings featuring a 7.63-carat rose-cut pear-shaped diamond, a 6.42-carat rose-cut pear-shaped diamond, and 2.86-carats of diamonds set in 18k ethical white gold paired with earrings worn in her veil featuring 12.26-carats of diamonds set in 18k ethical white gold, all from the Haute Joaillerie Collection. Nick donned his L.U.C Lunar Big Date timepiece. Both wore their Chopard wedding bands. Additionally, for the after-party, Priyanka dazzled in a pair of earrings from the Haute Joaillerie Collection featuring 115.63-carats of diamonds set in 18k ethical white gold. Both wore their Chopard wedding bands. On Sunday, December 2nd, for the after party of traditional Hindu wedding ceremony, Priyanka completed her look with a necklace featuring 184.50-carats of pear-shaped diamonds set in 18k ethical white gold, diamond earrings featuring a pair of pear-shaped diamonds totaling 6.07-carats, a pair of round brilliant-cut diamonds totaling 2.12-carats, and round brilliant cut diamonds set in 18k ethical white gold, along with a 16-carat oval-shaped diamond drop worn on her head, all from the Haute Joaillerie Collection. Nick also wore his L.U.C Lunar Big Date timepiece. Both wore their Chopard wedding bands.